An all purpose insecticide, miticide, fungicide for organic gardening. 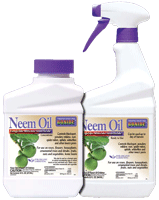 Derived from the Neem seed, Neem Oilis an excellent choice for use on virtually any plant, including roses, flowers, vegetables, herbs, spices, houseplants, trees, turf, and shrubs. Kills all stages of insects – eggs, larvae and adults. Makes a great dormant spray. Imparts a healthy shine to hardy leaf surfaces. Comes in an economical concentrate and convenient ready to use.